We cannot emphasize enough how much the trail benefits from simply having people use and enjoy it. People are the trail, after all, so go out for the day or for the weekend. Bring your friends, your parents, your children. The FTA is the trail's steward. Membership dues pay for maintenance equipment and build and repair boardwalks, bridges, and puncheons. They supply food to volunteers, and they pay staff who organize and coordinate volunteers. You can join as an individual, family, or business. Local chapters host maintenance projects, outdoor events, monthly meetings, and fundraisers. They plan trail routes, choose campsite locations, and more, as well as work face-to-face with land owners and managers. These clubs are the heart and soul of the FTA, where you can be most involved and have the most impact. 1) Check out upcoming volunteer opportunities on the FTA's website & find an event near you. Are you shooting for a Florida Bright Futures scholarship? Fulfill the 100 hours of community service requirement by volunteering to do trail maintenance and construction projects on the Florida Trail. Weekends spent hiking, camping, and working on the Trail will be rewarded with lots of money for college. Don't forget to bring your Verification of Service Form when you volunteer. Get an FTA coordinator to sign it, that way you get credit for your service. Are you a member of a university outdoor recreation club, like UF's OAR? Why not organize a volunteering event for your club on the Florida Trail? Contact Megan Donoghue at mdonoghue@floridatrail.org for information about getting your group on the trail. who serve in programs lasting anywhere from two weeks to twelve months. The SCA is possibly the best opportunity for students to learn, plan for, implement, and lead conservation and sustainability programs and practices. It is a pathway to jobs in green fields after you graduate. Visit their website or check them out on facebook. Are you looking for an Eagle Scout or Gold Award project? The Florida Trail is still a work in progress—that means there are endless projects and opportunities for scouts. The trail needs bridges, puncheons, campsites, and privies. Heck, you could even blaze a whole new section of trail. If you don't know how to do those things, that's okay. See if your troop leader has a copy of Lightly on the Land: The SCA Trail Building And Maintenance Manual by Robert C. Birkby. It has all the information you'll need. Read over the Eagle Scout Project Workbook or the Gold Award project requirements and familiarize yourself with the requirements and paperwork. Hike anywhere along its length you will probably find a project — a foot bridge that got washed out and never repaired, a broken well, a swamp tromp that needs a puncheon, or officially designated campsites without signage, a fire ring, picnic tables, trail register, benches, et cetera. You can also contact the FTA or one of its 18 local chapters directly (see above) and simply ask them if they have a project sitting on the drawing board that hasn't been finished because they lacked time, money, materials et cetera. Volunteer to complete it for them. Once you have identified a location and a project (bridge, puncheon, campsite, et cetera), write up a project proposal that details your plans. You have to do this as part of your Eagle Scout or Gold Award application. You will have to coordinate your project between four groups: the Scouts, the FTA, the US Forest Service (because is is the official government agency responsible for the Trail), and the agency that owns the land where you want to do your project. That could be the US Park Service, US Forest Service, Florida Park Service, Florida Forest Service, Florida Fish and Wildlife Conservation Commission, a water management district, or a private land owner. The FTA can help you contact these agencies and get permissions for your project. Create a detailed plan that outlines the who, what, when, and where of the project. We cannot stress this enough. If you are primarily a deer or turkey hunter, consider taking up boar hunting too. The invasive animals root up and destroy the Trail's footpath and campsites. It can look like a backhoe tore through the place when the hogs are done. In the disturbed soil they leave behind, invasive plants and weeds take hold. By killing the non-native animals you are helping to protect the Trail from damage, reduce maintenance demands on FTA volunteers, and preserve the lands surrounding the Trail. Call or email the Florida Fish and Wildlife Conservation Commission and encourage them to buy more land, either to expand existing wildlife management areas or create new ones. 2014's Amendment 1 means the state will be spending 10 billion dollars over the next twenty years to purchase lands for preservation and conservation. Your input about where to spend that money and what lands should be preserve is important, and direct calls from citizens is more influential and effective than most people realize. It doesn't take many calls to influence a decision, so why not do it? All around the state, ranches are being bought and turned into suburban housing. We are in a race against developers to preserve Florida's rural way of life. If you are a rancher or own a large property near the Trail corridor, consider getting a conservation easement. It will eliminate your property taxes and insulate the land from development so that your children, grandchildren, and grandchildren will know rural Florida as you know it. At this point, the Trail traverses all the public land it. If the Trail will ever be completed, it will need to go across more private lands like the Forever Florida Ranch. If you are a rancher or own land near the trail corridor and are open to the idea of letting hikers pass through your property, contact the FTA to discuss the details. You will not be liable if a hiker is injured on your property, and there are financial benefits as well. 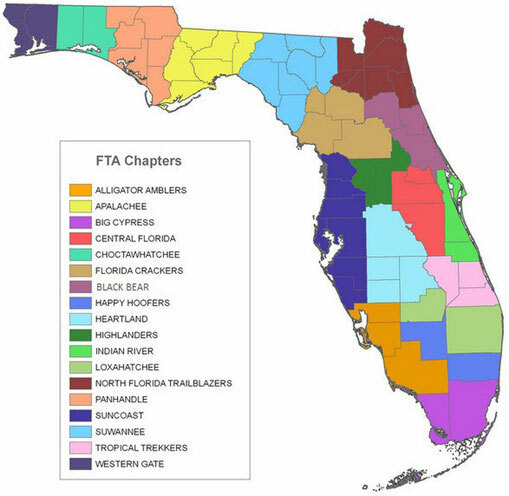 Donate some of your work to the Florida Trail Association to be sold, auctioned, or used as a prize in a raffle. Donations are tax deductible and will help finance ongoing land acquisition, trail building, and trail maintenance, as well as generate publicity for your work. Do you work for or donate to a land trust like the Nature Conservancy? While Florida has popular government land preservation programs like Florida Forever, the current governor and legislature in Tallahassee do not support them. Florida needs all the help it can get to save it from the developers, and private land trusts are crucial. At this point the trail traverses all the public lands it can, yet 300 miles of trail remain on roads. Consider having your organization purchase land along the trail corridor and help us create not only a contiguous, unbroken hiking trail through wild lands, but a 1500-mile-long wildlife corridor through the third most populous state in the country that can help save the panther.